Cool new peep sights add to respected line of sights, stabilizers, and accessories. Rick Clark has been involved in archery practically all his life and his story—the story of Viper Archery—is the quintessential American tale of a man pulling himself up by his own bootstraps and moving forward. From building his own makeshift bowsight at age 12 to offering precision-machined bowsights years later, Clark leads Viper’s production of high-quality hunting gear—gear that often bridges the chasms between success and failure for archers. As a bowhunter and competitive 3-D shooter, Clark understands the value of a quality bowsight, from micro-tune pin sights to delicate scopes, colorful peeps, and magnifying lenses. Pins that don’t rattle out of place. Light delivered via intensity-adjustable dots that won’t cause glare and obscure the target. Lenses that give just the right magnification. As a sideline, Clark has also developed a series of stabilizers, an innovative target, and a special set of pliers to take the painstaking effort out of tying D-loops to precisely the same length each time. Viper is known for sights, but for 2012, the addition to the line is a series of colorful machined peeps: black, gray, orange, pink, and Lost Camo. The theory behind the peep sight and hence its importance is that the human eye automatically centers the front sight when looking through the rear aperture, thus ensuring a greater degree of accuracy. With a neoprene insert to reduce string wear and vibration, Viper’s peeps ($7) come in two aperture sizes: ¼- and 3/16-inch. The larger-diameter aperture provides a brighter image. The smaller aperture, while allowing less light through the center, yields greater depth of field yielding a darker, but sharper image. 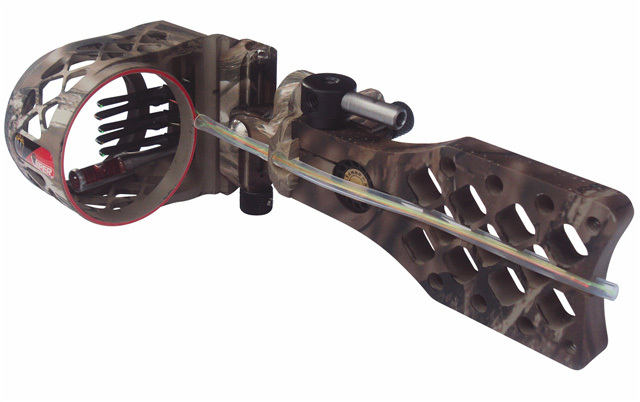 Viper builds sights for bowhunting and competition, both reflecting Rick Clark’s varied archery interests. The high-end CNC machined 6061 T6 aluminum Diamondback series debuted in 2011 with both fixed-plate and tooled, adjustable length sights. Viper’s camo of choice is Realtree AP or APG, and Mathews Lost Camo, but sights are also available in non-reflective black. Diamondback sights include five Razor Edge pins that are available in three diameters: .010, .019 or .029. Windage and elevation adjustments are separate and an oversized red level is included. Some of the sights in this series have built-in Mathews Harmonic Dampeners. A sight like the Pro 2000 ($145) will come with 7 ½ inches of protected fiber optic cables, an aperture threaded for Zeiss coated lenses in 2-, 3-, 4- and 6-power, and a 6-inch dovetail extension and mounting block. One might expect that a man with a background working with mining equipment, machining, and strength testing materials—a man who later worked for a company that produced precision military components—would not stop innovating with “just” a sight line. Indeed that is the case with Clark, who has put his restless genius to the test building a target, a stabilizer, and even special D-loop pliers. It is a small thing like the D-loop pliers that distinguish Viper from many competing companies. It’s all about attention to detail. Clark attributes Edgell Terry with inspiration for solving the problem of installing the perfect D-loop on a bowstring. Unless you are installing a metal or pre-formed loop, tying a loop that does not slip and tying it repeatedly at exactly the same length is frustrating. The D-loop pliers Clark and Terry built eliminate the fumbling. With Viper’s D-Loop Pliers ($25) installing D-loops became easy. Non-slip D-loops are pre-stretched and can be made the same length each time and knots can be pulled tight. The chrome-plated pliers have a non-slip handle and come with an instructional DVD. It is a small instrument that fixes a pro shop and home work-bench need. What’s not to like? Clark has also strengthened the stabilizer market, both for competition and hunting. Viper Stabilizers feature tubes CNC-machined from 6061 T6 aircraft aluminum so they are both durable and lightweight. They are filled with lightweight “ultra-shock absorbing pellets” and available in five finishes: Realtree AP HD or APG HD, Mathews Lost, black, and pink to match Mathews Passion ($20 to $30). The CNC-machined aluminum Quad-Rod competition stabilizer ($35 to $54 depending on length) is not currently available. From his days as a pro shop owner in West Virginia Clark understood the building blocks of business success. Quality products at a fair price; a drive to build gear that meets customer needs; strong customer service and support; and continuing involvement not only in the production, but in archery at all levels, from bowhunting to 3-D.
From his kitchen table, Rick Clark has grown Viper Archery Products into a state-of-the-art 20,000-square-foot building with two dozen full- and part-time employees. He operates seven CNC machining centers and a camo-dipping process. Viper Archery Products can be contacted at P.O. Box 738 (238 Township Road 1339), South Point, Ohio 45680 or by telephone at (740) 894-6100. Check out their web page www.viperarcheryproducts.com for the latest sights, scopes, peeps and shooting accessories. Viper also posts new photos and video to their Facebook.com page.